PDA Treatment Research Papers look at the different options used to treat this disease, and the different effects the treatment can have. 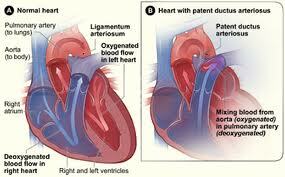 Treatment options for PDA Patent Ductus Arteriosus include; no treatment, the use of indomethacin or surgical correction of the defect. While PDA is not treated in some cases, Authors note, “In uncorrected cases of PDA, infant mortality is as high as 30%. Even though survival into adulthood is reported, this is frequently accompanied by severe complications. Pulmonary arterial hypertension almost always is present, and congestive heart failure develops frequently. As the disease progresses, the outcomes after surgical correction become poorer due to increased procedure-related mortality” . Thus, in most cases some treatment intervention is necessary for survival. Perez and Bustoroff-Silva report that in most cases of PDA indomethacin is administered. Although this has been the treatment of choice, over the last several years new research has suggested that the administration of indomethacin is linked to “increased incidence of renal failure, intestinal perforation, sepsis, bleeding disorders, intraventricular hemorrhage (IVH), and necrotizing enterocolitis (NEC)…”. As such, some experts believe that surgical intervention is the most appropriate method for handling even the subtlest forms of this condition. However, morbidity associate with surgery is often significantly higher than that associated with administration of indomethacin. While it is difficult to know for sure what treatment intervention—i.e. indomethacin or surgery—is the best method for ensuring the recovery of the patient, it is apparent that intervention is necessary to improve outcomes and quality of life. While there are those individuals that have survived with the condition over long periods of time, it is clear that these individual often do not enjoy the same quality of life as those without PDA. Given the wide breadth of knowledge that exists regarding this condition, it seems reasonable that treatment should be administered shortly after diagnosis to ensure the best possible outcomes. Paper Masters writes custom research papers on PDA Treatment and look at the different options used to treat this disease, and the different effects the treatment can have.